Inspired by AcuTake’s list of life-changers, here’s my list of 13 things massage can help you do in 2013. Some of them are specific, and some are lofty. Some of them are based on research. Some of them are outlandishly anecdotal. Whatever resonates, and whatever your new year’s resolutions, I hope massage helps you sparkle in 2013. Ah winter! Dry air, closed doors, close quarters, and germs. I know very, very few people in this city who have not had a bad cold in the last few weeks. A 2010 study suggested that a single massage can benefit the immune system to help you fight off the rest of the winter nasties. Resolve to get sick a little less this year. Excess stress is bad for you. Massage reduces stress. Ergo massage is good for you. Yes? Yes. It’s New Year’s Resolution time! ‘Tis the season of arriving an hour early to stake claim to bikes in spinning classes, of overlapping yoga mats in jam-packed rooms, of outrageous fitness bargains. Many of us are trying to work off the indulgences of the holiday season and enter the year fit and healthy. Massage may aid the recovery process after exercise. What better time to give it a whirl? The exercise and improvement efforts are great and all, but how about taking an hour or so to be nice to your body exactly as it is right now? That body of yours keeps you breathing, nourished, and moving through this world. We all have parts we think of as problematic, but taking time to celebrate your daily accomplishments, to release the places that are tense from hard work, can be a great way to focus on how much your body does for you and how wonderful it is. The owner of my studio space frequently jokes that she’s going to start taking before-and-after photos of people who come in for massage. We’re not actually going to go paparazzi on you anytime soon (or anytime ever), but people coming out of the massage room do have a tendency to look pretty blissed out. 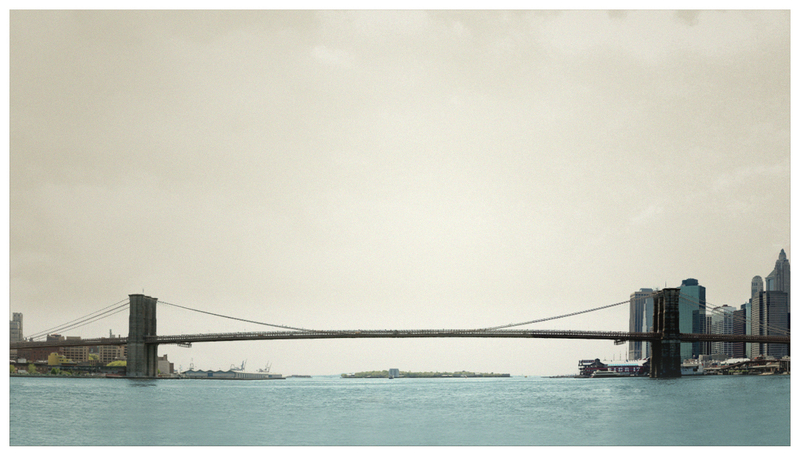 Ever meet someone who seems to be a bastion of calm in this hectic world, who brings peace to tricky situations? That could be you! For a minute or two anyway. Massage can help. A growing body of evidence indicates that Massage Therapy can help alleviate depression. There are also countless stories out there with so much more humanity than most studies convey, like this sweet and simple post from the Enlightened Body Blog last summer. I don’t hear many complaints about massage, but the one that I do hear, which I have experienced first-hand, is that massage sometimes draws attention to aches and pains that would otherwise have gone ignored. Sometimes we are so focused on our lower back pain or that weird clicking in the hip-joint that we neglect the slight ache between the shoulder blades, the tension in our hands, the fact that our feet take a daily beating, and we may not realize that these things exist until the higher priority issues are addressed. Discovering that we have more pain than we thought is not, at face value, the happiest discovery around. But it is useful in the long run for self-exploration, for figuring out what to address through further massage, stretching, and exercise, and for ultimately feeling better. Massage is an opportunity to tap into your body’s holding patterns, to learn more about how you move through the world, and to make adjustments that will improve your life. My friends at Anatomy in Motion recently posted some information from the American Chiropractic Association that caught my attention. 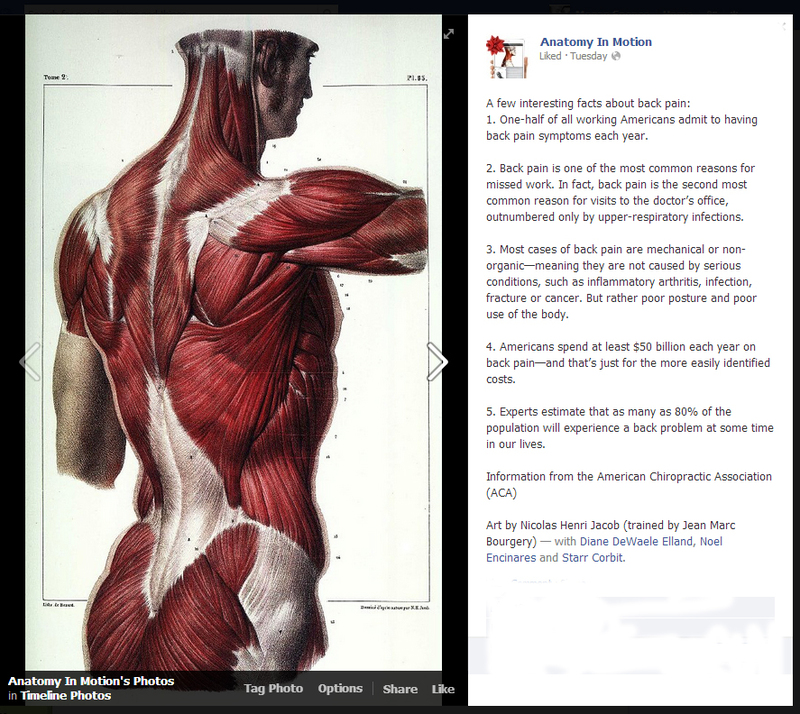 Click the image to see their full facts, or sign into Facebook to follow Anatomy in Motion’s posts (they’re lots of fun). Did you know that massage can be even better for non-specific back pain than a trip to the doctor’s office? A 2011 study found that massage therapy helped reduce pain and improve function more rapidly than usual medical care in people with chronic low-back pain. OK, this one is lifted directly from AcuTake. I obviously loved it because complementary care is one of my favorite conversation topics of all time. It never gets old. Even though massage doesn’t have the shiny needle aspect that is guaranteed to make you an instant hit at parties when you share acupuncture stories, we all have bodies, and talking about them might just be a new way to connect. I am married to a man who used to pop Ibuprofen like candy (except not really, because I doubt that he could get away with eating that much candy on a daily basis), and who made the decision to stop taking them a couple of years back. Reducing inflammation is an excellent way to relieve pain, but long-term use of high doses of NSAIDs (Non-Steroidal Anti-Inflammatory Drugs) wreaks havoc on the gastrointestinal system and carries the risk of additional side effects. A study in early 2012 suggested that massage may reduce inflammation. The study met with some valid criticisms, largely regarding bold conclusions drawn from a rather small study. While further research is needed to accurately conclude that massage reduces inflammation, study after study has demonstrated the effectiveness of massage in relieving pain (here‘s a sampling from several years ago; a simple web search yields many more). If 2013 is the year that you choose to wean yourself off of a daily NSAID regimen, massage can keep you feeling good while you make the change. Massage can improve your range of motion and help unstick your stuck places to get you moving into the new year with grace and greater ease. 13. Feel Better. Being Alone With Your Pain is So 2012. Whether you are struggling with a chronic pain in your knee or an ache in your heart, there’s a place for you on the massage table and people like me who are interested in troubleshooting tissue or simply soothing what ails you as best we can. If nothing else, resolve to be cared for this year, and to care for yourself. Here’s to a year of deep breathing and living that’s as easy as this world will allow. Happy 2013 to you! I love your blog and I hope you don’t mind that I share it on facebook and pinterest! Thank you for once again making my day! Great job! You rock!